Do you want to UPLOAD to MEGA? Try MegaUploader! 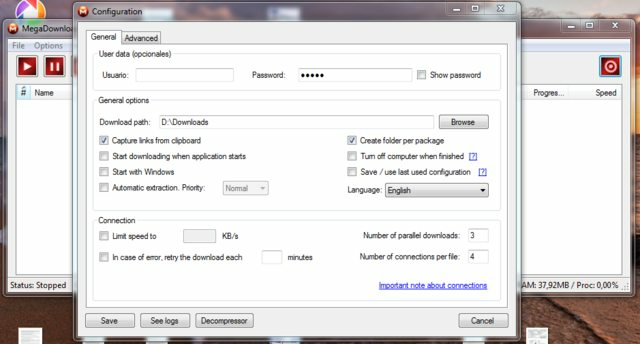 This application will install MegaDownloader, configure the registry and download all necessary dependencies (.NET) automatically. It will also add an "Uninstall" option. Softpedia guarantees that MegaDownloader is 100% Clean, which means it does not contain any form of malware, including but not limited to: spyware, viruses, trojans and backdoors. Please note that we only use adf.ly for the download link. We know many people don't like it, so if you don't want to use adf.ly, you can also download MegaDownloader by using this link. Thanks for your support. If you prefer you can use the portable version. - Removed minimize button in "Add links" window in order to prevent misbehavior when copy/paste links. - Corrected error with video streaming for folder links. - Added Steganography support /hide links inside images). - Changes to MEGA folder links (they started to raise an error "[-11]" due to a change in MEGA API). - Added links to search engines for MEGA files. - Improved download process with multiple connections. - Added link to check last version. - Simplified chinese translation, thanks to tankren. - Improved download process (less memory is used and the file is deciphered on the fly, without using an intermediate buffer). - Added the option to generate individual ELC links for multiple files. - Added support for mega links in Chrome. - Modified the speed calculation - previously it showed the average of the last 7.5 seconds, now it shows the average of the last 5 seconds. Apart of that the speed of the first second is discarded in order to avoid false peaks. - Fixed error with video streaming. Thx to Jhon Eslava for notifying the problem and send examples. - Fixed error with duplicated files (now the file is renamed). - Fixed error with MegaCrypter. - Improved performance when downloading big files. - Fixed error when MEGA gives a 403 (forbidden) error (it was not treated correctly and caused the program to crash). - Fixed error with download list from 0.7. - When adding links, the package name is not mandatory anymore; if empty, it takes the name of the first file. - Internal improvements, some minor bugs corrected. - Fixed error with XP SP3 when .NET 3.5 was not installed. - Support for DLC files. - Support for MEGA's shared folders. - Added "Force download" option. - Added support for VLC portable. - Fixed Allocine movie extraction (used in the streaming library). - Fixed streaming error (quickfix). - Fixed errors in Windows XP (need SP3). - Added support for mega:// URI. - Added option to generate encoded links. - Fixed error when resuming downloads (quickfix). - Internal improvements, bugs corrected. - Added multi language support.